At Shu Uemura Art of Hair, we appreciate your business and stand behind the quality of our products. If for any reason you are not completely satisfied with your www.shuuemuraartofhair-usa.com purchase, simply return it by following the steps below. Please note that items purchased from shuuemuraartofhair-usa.com must be returned toshuuemuraartofhair-usa.com . They cannot be returned to a Shu Uemura Art of Hair Consultant Salon. On the packing slip that accompanied your order, fill in the Return Form for each item you wish to return. Detach and enclose the Return Form, along with the product(s) you are returning, in the original packaging if possible. Peel off the pre-printed Return Label on the front of the packing slip and adhere it to the return package. We recommend that you send your return via UPS or insured Parcel Post for your protection and to ensure prompt delivery. Refunds on shipping are credited only when an item is incorrectly shipped or arrives defective or damaged. If you buy Shu Uemura Art of Hair products from unauthorized retailers or other unauthorized sources, we regret that we cannot offer you our money-back guarantee or otherwise assist you with any problems that you may encounter. Returns for purchases made in a Shu Uemura Art of Hair Consultant Salon may not be returned to shuuemuraartofhair-usa.com. 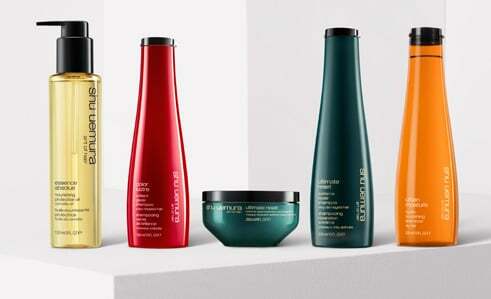 If you should need further information regarding the return of any Shu Uemura Art of Hair products, please do not hesitate to call us at 1-888-684-0220, and we will be happy to assist you however we can.